If the last 52 week money challenge you tried was too rigid to follow, you’ll love this bingo style money saving chart. It makes saving $1000 easy! 52 week money challenges are a popular way to save. But the problem with the charts out there now is that they aren’t forgiving. But don’t worry, because I’ve come up with the perfect solution! Our family spent more than two years paying off debt. 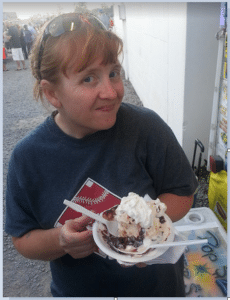 But one of the biggest things we learned along the way was that if you don’t keep an emergency fund on hand (even if you can only come up with $1,000 to put into it), you’re going to miss out on the most important part of the experience. That’s because the time to learn to use your own cash instead of credit cards is actually while you’re still paying off debt! That doesn’t mean that saving money has to feel like a chore. Or even worse, saving money shouldn’t feel like an impossible task! Use this fun chart to make saving more realistic for you. Have you seen those saving charts that tell you to save $5 this week, $10 next week, etc? Yeah, those never worked for me. Who’s to say I’ll have $10 next week?? My life doesn’t fit on a chart! For instance, in our home, May is a busy month that rivals December in cost. We’d struggle to save a lot in that month. But in your home, May might be the month when you get a big bonus. You’d be better off saving a larger amount that month. How can we make a money saving chart that works for both of us? Simple. I’ve pulled together a variety of amounts of money that add up to $1,000. This chart allows you to pick and choose the right amount of money for the kind of week you’re having. And the bingo style of the chart makes it way more fun to use! Choose a day of the week (Sunday, Monday, whatever day you get paid, etc.). Each week, on that day, pick the dollar amount from the chart that you can afford to save. As you use a number, cross it off or color in that square so you don’t repeat it. And for that really rotten week that just will not end, you get a free pass. The week an unexpected rebate check shows up in the mail, cross off a bigger number! I’ll share a few more ideas for getting extra cash below. Need a bigger challenge? Add a zero to the end of each number to save $10,000 this year! Most money saving challenges fizzle because people don’t have a good solid reason for doing them. Don’t settle for a wishy washy “because I’m supposed to save money” reason. That won’t carry you through a full year of savings. Instead, have a why. In fact, have two whys! Why do you want to save money? If you’re trying to establish an emergency fund or pay off debt, those are excellent goals. But it’s not enough. Know why you’re saving for an emergency or why you want to pay debt. If you have a solid picture in your head of what life without debt looks like (for instance), that will help you through the rough weeks where you’d rather see a movie than save money. Click the chart to print your own copy. Attach it to a large envelope (for saving the money in). Or hang it on the fridge where you’ll see it often while you store the money in its own bank account. You could even put your copy in your favorite planner. These stickers from Etsy are adorable (and super affordable)! Grab a pack to make marking off the numbers on your chart more fun than ever! Here’s A Great Way to Kickstart Your Chart! The FREE Guide to Kickstart Your Savings! Your email address is always safe with us and will never be sold! Decide where you’ll keep the cash. You can paste the chart on a large mailing envelope or in a jar. But you might want to open a bank account just for this money. Not only will you earn interest on your money, but all that cash won’t be easy to access for late night pizza cravings. Online bank accounts are an awesome way to save. Transferring money is super easy, and it’s out of sight, out of mind. I’m a huge fan of online banking! In fact, we’ve banked this way for over a decade and have never had a problem. CIT Bank has a fantastic interest rate…double (or better!) what you’ll find if you open a local savings account. It’s so easy to open your account right now (yes, even late at night, in your jammies!). Can you use some money from your paychecks to fill this account? You probably have more wiggle room in your budget than you realize. Click here to open your own free Personal Capital account and find that leaking money! If finding the cash in your regular budget seems impossible, you probably need ideas for finding extra money. But you’re in luck, because you can download this free cheat sheet with ideas for finding money to finish this challenge! Grab your copy of this and other money saving ideas here. Or try my book, 500 Ways to Save Money: Build a Cash Jackpot for the Best Things In Life. There are so many actionable tips in this book that you’ll make your money back right away. And then you can really start socking away the cash! Really, actually, finally save up that $1,000 this year! How long has that been on your list of things to do? This 52 week money challenge is just what you need to officially become a saver. BINGO! Have fun, reach your savings goal, and win! Have you ever taken a 52 week money challenge? 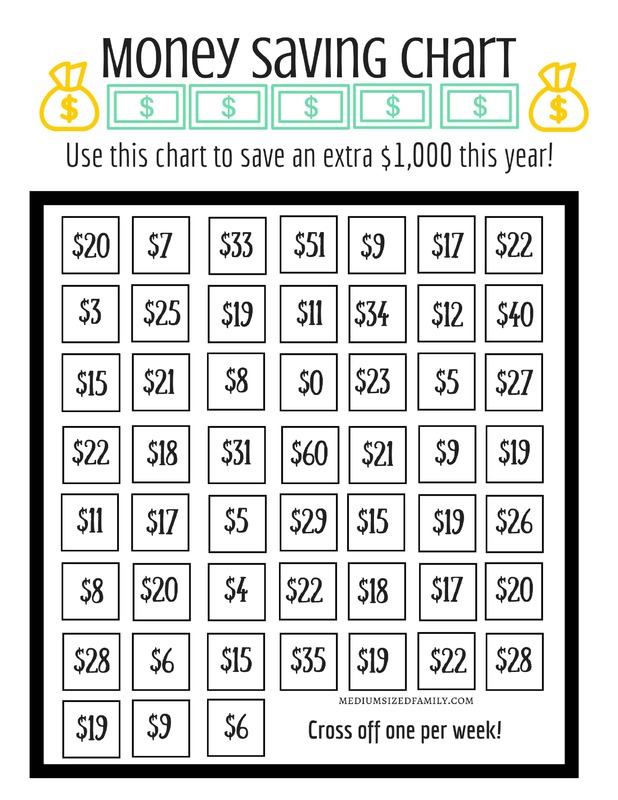 If the last 52 Week money challenge you tried was too rigid to follow, you'll love this bingo style money saving chart. It makes saving $1000 easy! 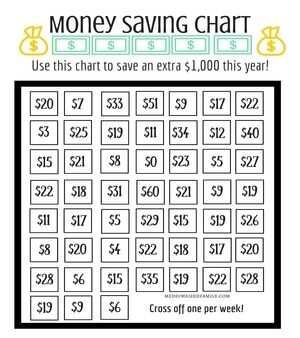 I’ve never used a money saving chart, but I do like the idea. I think your “flexible” chart is a brilliant idea for saving up a nice chunk of money. The challenges that require you to put the same amount in every week mean that if you can’t make it for one week, you’re more likely to quit altogether. This one keeps you motivated, almost like playing a game to see how high you can get in any given week. Thank you! That’s what I was hoping for. I’ve seen some that start with lower numbers and gradually increase, but I know (for instance) that my May is as crazy as December. So that wouldn’t work for me. I’ve never used a money saving chart, but I really like the visual and the ability to cross off progress! What a fun way to save money! It’s almost like a game with a guaranteed payoff. Such a great idea…thanks for sharing the downloadable chart. I really enjoyed this post. I am always looking for ways to mix up my savings plan. I am currently using a combination method of saving as many five dollar bills as I can and saving and “found money” that comes our way. Love those ideas! I don’t use cash often enough to save $5, but you can bet that all found money is already ear marked. (Though in our case, it’s going to pay down debt.) Thanks for stopping by! I like this idea better than others I have seen that either increase or decrease (or stay the same) every week. Some weeks it is easier than others to save. And this makes it seem like a game. What a fun way to save money! I love the gamification of saving. This is great! This looks like fun and I can’t wait to begin. Great tips! I’m going to try the Bingo chart, that’s the first time I’ve seen that. Looks like an easy way to save, plus those weeks money is tight, I don’t have to feel bad…just put back one of the smaller amounts! Love it! Thanks! That’s what I was aiming for. We all have “those weeks”. I love this idea to save money. It’ll make the process not seem so overwhelming which I definitely need. It also allows variety and flexibility which makes saving a bit more fun. Thanks for this! I love this, Bingo for Cash! Thanks for making the chart sharable and printable. I like this flexi money saving chart best. And I may just get my kids involved. Thanks, Jamie! I LOVE money saving charts. This is my first time with this one, but I like how it’s set up. I’m going to laminate it and then it makes it easier to check off what you’ve done so far! Laminating is a great idea! Mine tends to get crumpled from use. Just found this and I love scrolling through comments a year old and realizing, you have done something that has no end date! Isn’t it awesome that what you create can help so many people, even years later! Thank you for this, like all the others, I love the simple nature of the way you chose to do the amounts, I feel like this challenge is actually possible (I have passed over lots because they don’t look reasonable). So glad I found this, thank you! Yes! The idea is that you can start ANY TIME. Why wait for January to start saving?? I’m so glad you find this chart helpful!